Dave is an accomplished litigator who represents clients in complex financial and professional litigation matters of all types, including professional liability, securities fraud, breach of fiduciary duty and shareholder disputes. In addition, he has litigated on behalf of business clients regarding the Employee Retirement Income Security Act (ERISA), the Comprehensive Environmental Response, Compensation and Liability Act (CERCLA), class action lawsuits, insurance coverage disputes, failed thrift litigation, business torts, contract disputes and professional licensing matters. 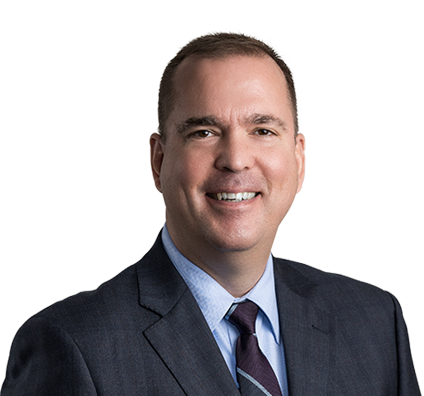 Dave also advises professional service firms on loss prevention and claims handling in a variety of settings and serves as the firm’s general counsel. Defending a major regional professional services firm against various claims of professional malpractice and securities fraud with favorable outcomes. Representing two of the nation's largest pharmacy benefits management companies in six class action lawsuits challenging certain drug copayments. Clients had complete victory in all the suits before any class was certified, and without going to trial. Advising a major chemical company in various CERCLA litigation matters. Representing professionals before Missouri professional licensing boards. As general counsel, Dave oversees legal matters, ethics, conflicts and loss prevention for the firm. Defended a major regional professional services firm against claims of professional malpractice and securities fraud. Represented two of the nation's largest pharmacy benefits management companies in six lawsuits challenging the co-payments charged for a commonly prescribed drug. The lawsuits were filed nationwide under various legal theories, including the Employee Retirement Income Security Act (ERISA) and multiple state-law causes of action, and each sought certification of a nationwide class. The clients had complete victory on all the lawsuits before they could be certified as a class or go to trial. Favorable judgment affirmed on appeal. Defended a class action-styled case on behalf of purchasers of subordinated capital notes issued by a federally chartered savings association that the Resolution Trust Corp. placed in conservatorship. Plaintiffs alleged breaches of state and federal securities laws. Following the court’s granting of summary judgment in favor of the directors on all of the plaintiffs’ class claims, the Federal Deposit Insurance Corp. (FDIC) settled its claim for an amount substantially less than the estimated cost of defending the action. Counseled Torchmark Corp. and its subsidiary Globe Life and Accident Insurance Co. in a $900 million ERISA class action lawsuit. Plaintiff sought recovery on behalf of 23,000 present and former independent contractor insurance agents. Summary judgment on the ERISA claims was awarded. Represented a major chemical company in various Comprehensive Environmental Response, Compensation, and Liability Act (CERCLA) litigation matters with favorable result. Represented professionals before Missouri licensing boards.